Ecommerce shipping software lets you compare shipping rates among different carriers, select the best option for each parcel, and print shipping labels. We reviewed the best shipping software providers and found that ShippingEasy, ShipStation, and Ordoro cover a range of small business and ecommerce shipping needs in terms of price, ease of use, and key features. ShippingEasy is our recommendation for the best shipping software because it offers a free starter plan and is competitively priced as needs increase, is extremely user-friendly, and connects to virtually all ecommerce platforms. It also delivers timesaving and revenue-building tools, such as multichannel inventory management and email marketing tools — and help is just an email or phone call away. Outsourcing fulfillment can dramatically lower your shipping rates and free up your time so you can focus on building your business. FulfillmentCompanies.net will help you find the perfect fulfillment company for your business — for free. Click here to get started. We recommend ShippingEasy as the best overall ecommerce shipping software in 2018 because it delivers the best mix of shipping rate comparison tools, multichannel integrations, and inventory management features for the best price. For the price, ShippingEasy delivers more shipping features than its close competitor, ShippingStation. Plus it also delivers an impressive set of multichannel ecommerce inventory management features that rival Ordoro, but at a fraction of the cost. In terms of multi-carrier shipping software for rate comparison and shipping label printing, ShippingEasy vs. ShipStation vs. Ordoro all perform equally well. Each of our best shipping software picks let you compare shipping rates among various carriers, select the best shipping option for each parcel, and print labels with ease. 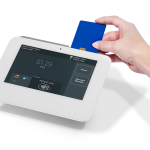 All three also handle return labels, print packing slips or invoices, support batch and automated shipping rules, and send tracking information to sales channels and customers. All three also save users between 10 to 65 percent off USPS shipping via Commercial Base and even lower Commercial Plus discount rates. Where they differ, and where ShippingEasy pulls ahead of the others, is in the many shipping, order, and inventory management features it delivers for less. ShippingEasy offers a free plan that supports unlimited sales. Ordoro has a free plan too, but is limited to one sales channel. ShipStation doesn’t offer a free plan at all—its lowest plan is $9 per month. ShippingEasy also has a very robust multichannel inventory management package that you can add to any paid plan, starting at just $14 per month. With it, you can update stock levels across all of your sales channels, create purchase orders, and track stock receipts. ShippingEasy also offers a built-in email marketing service for all plans, starting at $3 per month. Neither ShipStation nor Ordoro offers this. In short, ShippingEasy delivers far more than multi-carrier shipping software at a very economical price, and you can add these features as you grow. There are a few drawbacks to ShippingEasy. For a high-volume shipper that relies on direct connections to dropship suppliers, Ordoro’s highly advanced automated dropshipping features beat ShippingEasy. But the cost difference is extreme—from $150 to $450 per month, depending on the plan. If you ship both parcels and LTL truck freight, ShipStation readily integrates with a larger range of carriers than ShippingEasy. Aside from those specific needs, ShippingEasy truly delivers the best ecommerce multi-carrier shipping software solution for the price. ShipStation handily beats both Ordoro and ShippingEasy in the number of carriers its multi-carrier shipping software supports. It offers far more plug-and-play integrations with fulfillment centers, freight companies, and international carriers than our other two picks. Since these types of shipping services are typically used by mid- to high-volume ecommerce sellers, this impressive feature doesn’t weigh as heavily for small business needs. However, it’s nice to know you can quickly scale up to meet freight and international shipping demands as needed. Like our other picks, ShipStation also offers wonderfully intuitive order processing and multi-carrier shipping rate comparison screens. You can easily access and print order invoices, packing slips, and shipping labels—individually or in batches—and send shipment tracking data back to sale channels. ShipStation supports both USPS Commercial Base and Plus discounts, but its Plus discount is limited to shipments under 10 pounds. ShippingEasy and Ordoro don’t have this limitation. If you ship parcels larger than 10 pounds, ShippingEasy and Ordoro both offer more USPS savings. ShipStation also leaps ahead of Ordoro and ShippingEasy in shopping cart, multichannel, and marketplace seller integrations. It seamlessly connects to a huge number of selling platforms—50 and counting—and if it doesn’t readily connect to yours, you can through its open API. Where ShipStation really falls short of our other picks is in built-in inventory features. ShipStation does have a basic inventory tracking feature on all plans, but it does not send counts back to sales channels, unlike ShippingEasy and Ordoro. This can be a real problem for multichannel sellers. The lack of a free plan also demotes ShipStation. 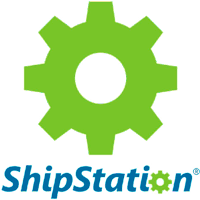 ShipStation has excellent user reviews and is very popular, but there’s no free ride at all. You have to pay at least $9 per month to access ShipStation. That makes the free plans from Ordoro and ShippingEasy better choices for low-volume and occasional shippers. However, ShipStation does offer a 30-day free trial with no credit card needed to sign up. So it cost you nothing to give ShipStation a try. Ordoro delivers excellent ecommerce shipping rate comparison software at a price that’s very competitive with our other two picks. You can quickly compare rates among different shippers and service levels in intuitive screens, print labels per-package or in bulk, and update tracking data to customers and sales channels upon shipment. Ordoro also offers users USPS Commercial Plus discounts equal to ShippingEasy, which beats ShipStation’s limited Plus version. Ordoro offers a free plan for sellers shipping under 50 orders per month, and paid plans that are in-line cost-wise with both picks. However, Ordoro’s free plan has a one-channel limit, unlike ShippingEasy’s unlimited channels—though it beats ShipStation’s $9 starter plan. Where Ordoro really impresses is in advanced inventory management and automated purchasing features that seamlessly integrate with its shipping system. If you need a highly-advanced shipping, purchasing, and inventory tracking system that supports multiple warehouses, dropship orders, and even inventory data feeds from vendors, Ordoro truly delivers. However, adding Ordoro’s inventory and purchasing management combination to a shipping plan does not come cheap. Unlike ShippingEasy, which adds a robust set of multichannel inventory features to paid plans for just $14 to $49 per month, Ordoro’s shipping plus inventory plans cost $299 to $499 per month. If you just need to track inventory, update counts to sales channels, and manage purchasing, ShippingEasy does it all for less. But, if you’re a volume shipper with an expansive dropship supplier base or multiple fulfillment warehouses, Ordoro’s efficient system is likely worth the cost. Aside from costly shipping and inventory plans, the other downside is Ordoro’s limited plug-and-play sales channel integrations compared to ShippingEasy and ShipStation. Ordoro offers plug-and-play integration with 18 sales channels, whereas ShippingEasy and ShipStation plug-and-play with over 35 and 50, respectively. That said, Ordoro offers API integrations and will help you establish connections to sales channels, fulfillment centers, and dropshippers as needed. Each of our best shipping software picks’ monthly fees increase with your shipping volume. 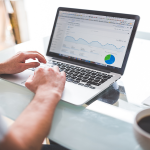 However, as monthly rates increase, so do the features available, such as user access, inventory functions, and increased support. As you grow, you’ll likely find these time-saving features are worth the price. ShippingEasy’s pricing is simple and straightforward. All plans support unlimited sales channels and users, and your orders-per-month and features increase with each plan level. ShippingEasy’s free, 50 orders-per-month plan supports unlimited stores and users, which beats Ordoro’s Free plan. In fact, all of ShippingEasy’s plans support unlimited stores and users. This is a nice feature for testing different sales channels. 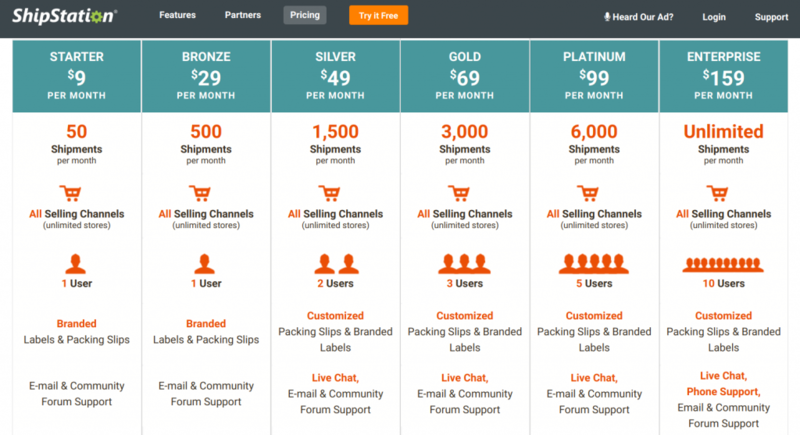 As shown above, pricing increases based on monthly shipping volume and starts at $29 per month for 500 orders. Other handy business management features, like inventory management and email marketing, can be added for a monthly fee that is based on your shipping plan. Overall, the $49 per month plan is a great value for most small ecommerce business. It supports 1,500 orders per month and gives you access to all shipping features, including the exclusive Flat Rate Green discount shipping program. If you add inventory features and email marketing to the $49 plan, you can fully manage a multichannel ecommerce business for just $82 per month. That’s quite a deal. ShipStation’s plan levels and costs closely mirror ShippingEasy, except it has no free plan and limits users per-plan, unlike ShippingEasy’s unlimited users on all plans. ShipStation does not offer a free plan; its lowest plan price is $9 per month for 50 orders—here, ShippingEasy is the clear winner. Like the others, ShipStation’s pricing is based on monthly order volume and supports unlimited sales channels, and even includes its basic inventory features at no extra cost. However, your users are limited per plan. If you need to have three or more staffers access the platform to manage orders, shipping, and inventory at the same time, you need the $69 plan or higher. Both ShippingEasy and Ordoro support unlimited users on all plans. Ordoro’s shipping plans are a good value and allow more orders for the price compared to our other top picks. Ordoro’s paid shipping-only plans are actually a better deal than both ShippingEasy and ShipStation; they support more orders and unlimited sales channels and users, and all plans support an array of multi-carrier shipping software features. However, to add inventory and purchasing management features, your costs jump dramatically, to $299 or $499 per month, depending on the plan. But these features are mighty impressive and if you’re juggling multiple dropship vendors or fulfillment warehouses in your multichannel ecommerce business, Ordoro is built for efficiency. 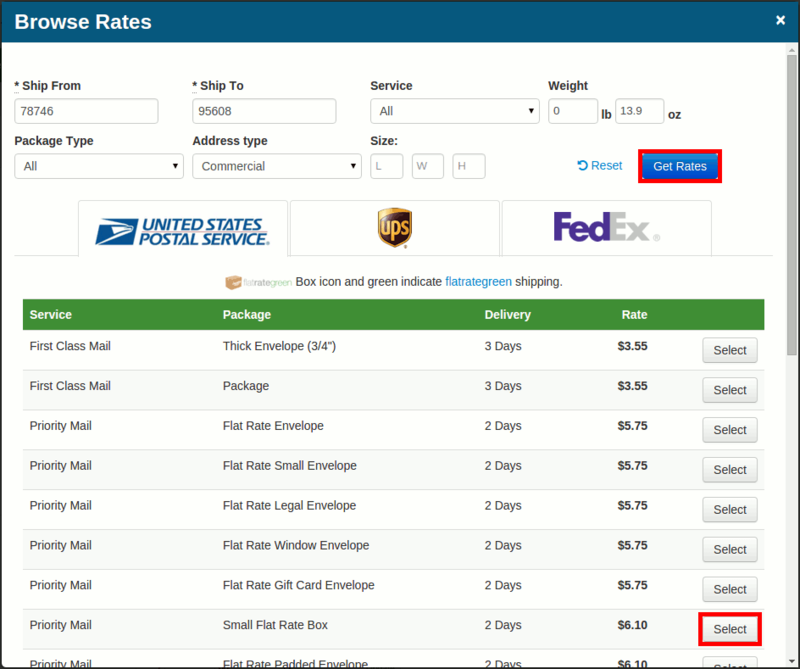 This is the number one reason every ecommerce seller should consider using shipping software with a rate comparison tool. To stay competitive in ecommerce, you need to control shipping costs wherever possible. Comparing rates among UPS, FedEx, USPS, and DHL is the best way to ensure every order ships at the lowest cost. Our top picks let you compare carrier rates, select the best, and print shipping labels all from one convenient screen. With ShippingEasy, you can easily swap between different carriers to browse all shipping rates on one screen. 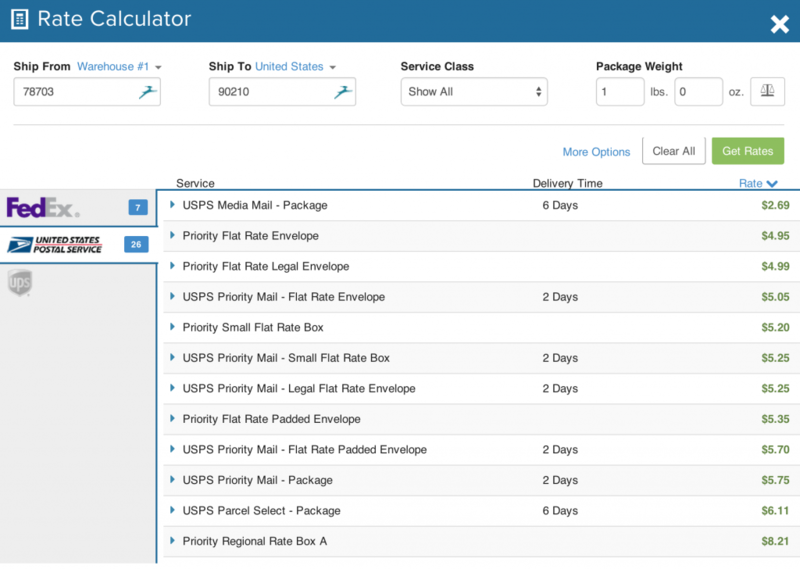 Of the three, ShippingEasy has the simplest rate comparison screen. If you’re on the $49 plan or above, their Flat Rate Green discounts appear in this screen for applicable shipments, too. ShippingEasy lets you easily toggle between carriers and view rates for all methods on every package you ship. In ShipStation’s order shipping screen, you can select carriers and methods from the pull-down menu to compare rates for each shipment. Plus you can select the warehouse location you’re shipping from in this screen. This is a helpful tool if you ship orders from different warehouse locations. ShipStation’s multi-carrier shipping software has an intuitive rate comparison screen that lists all available shipping methods and rates per-carrier. Ordoro lets you easily toggle between carriers and shipping methods in one screen. On the highest ($129 per month) shipping plan and the shipping plus inventory plans, you can also manage orders shipping from dropship vendors and multiple warehouses within the shipping screen. Ordoro lets you toggle between carriers and shipping methods to compare rates, plus select which warehouse or dropship vendor an order will ship from. All three of our multi-carrier shipping software picks link to UPS, FedEx, and DHL via your carrier account and display your contracted shipping discounts on screen. So when comparing rates, you see the actual rate you’ll be paying when your bill comes. USPS Commercial Base – This is the same rate you receive when you print labels on USPS.com. All three of our best shipping software picks support Commercial Base on the free or lower-level plans. USPS Commercial Plus – This a much higher discount normally available only to high-volume shippers. All three of our top picks make it possible for smaller shippers to tap these rates on paid plans. However, ShippingEasy limits Commercial Plus rates to packages under 10 pounds. If you only ship via USPS, you can do it all with Stamps.com shipping software. Stamps.com offers discounts up to 40 percent off USPS-approved postage. The software also automatically imports your orders from wherever you sell, selects the best shipping method based on price and delivery speed, and emails your customers their tracking information. Click here to start a four-week trial and get $5 in free postage. ShippingEasy: Free plan users get the USPS Commercial Base discount and all paid plans get the better Commercial Plus discount. ShippingEasy also has an exclusive USPS discount plan called Flat Rate Green. For heavy items that ship in boxes under a cubic foot, this plan offers impressive savings. ShipStation: All ShipStation plans get USPS Commercial Plus rates, but the savings are limited to packages under 10 pounds, Commercial Base applies to packages 10 pounds and up. In contrast, both ShippingEasy and Ordoro have Commercial Plus on all paid plans, regardless of shipping volume. ShipStation also has a savings partnership with FedEx, called FedEx Advantage, that saves you 20 to 39 percent on Ground and Express services. Ordoro: Ordoro enables USPS discount rates on all plans. Commercial Base, the lower discount, is available on the free plan, while all paid plans receive the higher Commercial Plus discounts. All three top picks make it easy to print and send or email return labels to customers. This is an especially handy feature when you need to cover return costs for incorrect orders or damaged goods. Plus, you can assign return authorization numbers (RMAs), and even add package pickup if needed. You can easily create a return label from ShippingEasy’s shipping screen. There you can select the items being returned to generate the correct weight for the return label. You can also return shipments via any method you prefer and select which location should receive the return if you ship from multiple locations. You can quickly create and print or email return labels from ShippingEasy’s shipped orders list. In ShipStation, you can create a return label for a specific order from the shipping screen, select items to be returned, choose the carrier and method, and select which location should receive the return, if applicable. ShipStation returns are handled from your Shipments screen by checking the order and clicking Create Return. You can quickly print return labels in Ordoro from your shipped orders list, shown below. You can also select specific items(s) being returned so label weights are correct, and select the carrier and method you prefer. If you ship from different locations, such as a dropship supplier or separate warehouse, you can select which location receives the return. In Ordoro, you can create return labels from your Shipped Orders list or within the shipping screen detail. Ecommerce Platforms and Shopping Carts – These are online store platforms that allow you to accept orders on your own website. Some top platforms include Shopify, WooCommerce, and Volusion. Seller Marketplaces – These include multi-seller websites like Amazon, Etsy, and eBay, where you can sell goods without having your own website. However, many small businesses sell on both their own website and in one or more seller marketplaces. ShippingEasy: You get plug-and-play integrations with more than 35 carts and seller marketplaces with ShippingEasy. Its shipping integration is seamless and fully handshakes to send shipment tracking information back to all channels. If you add the inventory management features, you can integrate count update across all channels, too. ShipStation: Of our three best shipping software picks, ShipStation integrates with the most shopping carts and marketplaces—more than 50. It fully handshakes to send shipment tracking information back to all sales channels, but inventory counts don’t update to any sales channel. The inventory features of both ShippingEasy and Ordoro top this. Ordoro: This is one point where Ordoro differs greatly from ShippingEasy and ShipStation. Ordoro integrates with far fewer sales channels—just 18. But, like the others, it’s a full two-way integration that sends tracking data—and inventory counts if you add that feature—back to all sales channels. Dropship vendors and third-party fulfillment (3PL) services are ecommerce order shipping methods used by many small and growing online businesses. All three of our top ecommerce shipping software picks let you send assign orders to specific dropship vendors and fulfillment centers manually or using automated rules. ShippingEasy supports dropship and fulfillment partner orders using the multi-user and multi-warehouse features available on every plan. This lets you assign a warehouse location and user login to your vendor or fulfillment partner, and they can access orders that they need to ship right in your ShippingEasy platform. Or, you can connect dropshippers and fulfillment partners via API connections and set up automated rules to route orders. With the inventory feature add-on, you can auto-generate dropship purchase orders and forward them for fulfillment, too. For dropship orders, ShipStation works much the same as ShippingEasy. You can make it happen by assigning warehouse locations to various dropship and fulfillment partners and route dropship orders using automation tools. Where ShipStation really stands out is in their ready-to-go 3PL integrations and easy API connections. If you plan to outsource some of your order fulfillment to 3PL services, ShipStation is one to consider. You can manage orders shipping via dropship vendors and fulfillment services using the multi-warehouse feature, available on Ordoro’s top $129 per month shipping plan. It lets you route orders to various warehouses, which can be dropship vendors or fulfillment services. But, unlike ShippingEasy and ShipStation, Ordoro’s multi-warehouse feature is limited to the highest shipping plan. Where Ordoro really shines in its handling of orders shipping via dropship vendors or fulfillment centers. Using Ordoro’s shipping plus inventory plans, you can set any item to automatically ship from a dropship supplier or outside fulfillment service when ordered. Ordoro’s dropship, fulfillment center, and multi-warehouse management are real time-savers for volume shippers. Shipping and inventory management are closely tied together in any ecommerce operation. Even if you just want the best shipping software for comparing rates and printing labels for now, as you grow, your inventory tracking needs will too. So we considered inventory management features in our shipping software reviews as well. 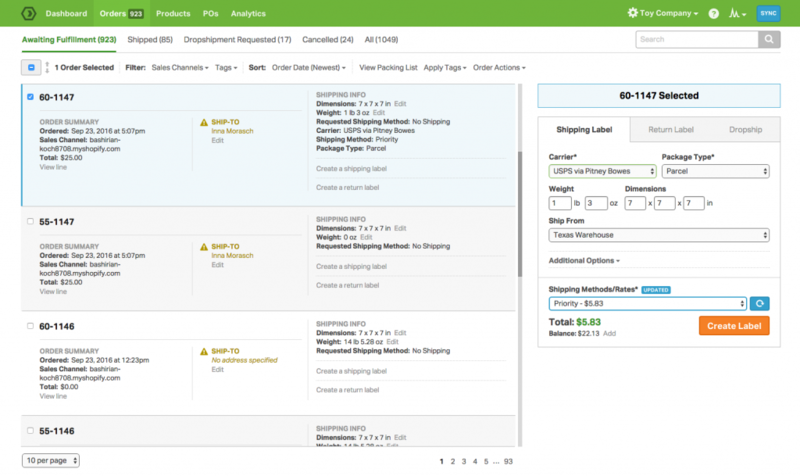 ShippingEasy: ShippingEasy’s inventory management features are the best value of the shipping software platforms we reviewed. Inventory features can be added to any paid account, with costs ranging from $14 to $49 per month, depending on the shipping plan. Inventory features include two-way updates with sales channels, automated and manual purchase orders, product kitting and bundling, and much more. Altogether, inventory plus the base shipping plan will run you just $43 per month; at the highest shipping plan, it totals $148 per month. For a growing ecommerce seller, the time saved by streamlining inventory tasks is truly worth every penny. ShipStation: ShipStation includes basic inventory features with every plan—which is nice, but it falls short on a key functionality. It doesn’t automatically update product availability to any sales channel. That means you’ll have to manually update inventory counts and product availability on your website and other selling channels on a regular basis—or use an outside inventory management system like StitchLabs or SellBrite to handle this, which adds costs. Ordoro: Ordoro tops the rest in advanced inventory features, though ShippingEasy isn’t far behind. Ordoro’s inventory system does things the others simply don’t. Fully-automated dropshipping, real-time vendor inventory feeds, and highly advanced kitting, bundling, and parts tracking are included in Ordoro inventory. But it all comes at a hefty price of $299 to $499 per month. For most growing ecommerce businesses, ShippingEasy’s $14 to $49 inventory add-on does what’s needed for far less. All three of our top picks provide free onboarding support to get you up and running fast. Each provides excellent online knowledge base information and tutorials as well. The only real difference is in the free phone support, which we detail below. ShippingEasy: ShippingEasy provides free phone and email support for all of your setup needs. For ongoing support, free plan users can find answers in the online knowledgebase. Paid plan users can get help via phone, email, and live chat from 8:30 a.m. – 5:30 p.m. CST Monday – Thursday, and 8:30 a.m. – 5 p.m. CST on Friday. ShipStation: ShipStation provides 30 days of free phone and email support to help all plan users get set up. For ongoing support, all plan users can access the online knowledgebase, and get help via email and the community forum. Live chat is available to users on the $49 and higher plans and phone support is available at the $159 plan level Monday – Friday, 8 a.m. – 6 p.m. CST. Ordoro: Ordoro offers free phone and email support to help with setup on all plans. For ongoing support, free plan users can get email support and use the online knowledgebase. Phone and email support are available for users on all paid plans Monday – Friday, 9 a.m. – 6 p.m. CST. Comparing rates among multiple carriers is the only way to ensure you’re getting the best shipping rate on every package you send. If you ship with a variety of carriers, multi-carrier shipping software is a cost- and time-saving asset that benefits your entire operation—and your bottom line. In our reviews, the best shipping software solutions let you easily compare rates among carriers and shipping methods, print order paperwork, manage shipments manually or in batches, print shipping labels, and create return labels. Our top ecommerce shipping software picks also integrate with multiple sales channels and carriers, and offer a range of dropship, multi-warehouse, and inventory management features. Where they differ greatly is the number of channels, users, and available features for the price. Taking everything into account, ShippingEasy is our overall pick for the best shipping software for ecommerce and multichannel sellers. Its free plan is the most generous, and paid plans offer unlimited channels and users across the board. Finally, add-ons like inventory management and email marketing are impressive and very economical. It delivers the shipping and order management tools that multichannel sellers need to grow at the best price. However, if you only ship via USPS, you should give Stamps.com a try. You get a free postal scale upon sign-up and you can print all types of postage—from First-Class Stamps to Priority and Express shipping labels—right from your desktop printer. It even supports USPS Commercial discounts, which saves you up to 40 percent off retail rates. Do you use Ordoro, ShippingEasy, or ShipStation or another ecommerce multi-carrier shipping software solution? How about Stamps.com? We’ve love to hear what works best for your ecommerce shipping operation in the comments below. Great info but I was looking for info on who allows shipping labels with invoice/packing list all on one form. A few years back we spent a lot of time searching and only found Ready Shipper that we use now but customer support is not all their and they still recommend we stay away from their new Cloud base Ready Cloud. So any info on these 3 starting to allow all in one shipping label? I’m not sure if any of these three do that, but you can contact them to see. I used those in my early days and I ran them using Mail Order Manager software. The forms with the built-in labels were pretty pricey, so we moved to Ordoro and ran unique labels. One or all of these might integrate with a standard form, I’d just give them each a call to find out. Great article! I appreciate the time you took to detail out the specifics (like the inventory features) which you could have glanced over. Too often review articles are shallow as a rain puddle when it comes to depth. That’s why I’ve bookedmarked fitsmallbusiness.com as a reference source when researching for my ecommerce companies. 1. Determining dimensional weights which is always greater then a package’s actual weight for our larger orders. This makes quoting shipping estimates challenging until an order is actually processed. 2. Bigger issues – We’re finding it challenging as we scale due to the lack of inventory management features. Until we find a more robust solution we elected to use manual spreadsheets in Google Drive and ShipStation for processing shipping labels. Outside of these two issues ShipStation is a fantastic tool which I highly recommend for smaller ecommerce businesses. Based on your article we’ll check out Ordaro to see if it’s a better fit based on our evolving needs. Thanks again, keep up the great job! On a side note, I feel there is a big gap in the market when it comes to content that geared to ecommerce/retail companies that are past the initial start up phase but are smaller then enterprise businesses. I’m talking about companies that are $2 – $20 million in revenue. There are plenty of content sites that focus on starting a business or focus on enterprise companies. When you’re a medium sized company you can’t yet afford the enterprise solutions out there, however your business has grown where the start up focused software stacks just aren’t complex enough anymore. I understand there aren’t as many businesses in this category, so most sites don’t address this market. Something for you to consider. I think you should check out Ordoro asap (like, today!)!!! I had great luck with them. I was just under $2M in annual sales, so I get exactly where you’re coming from. Plus my average sale was only about $30, probably far less than yours seeing what you sell. So I may have actually moved more volume on shipping. 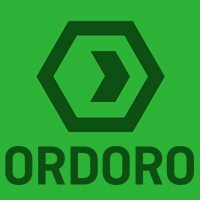 Both Ordoro’s shipping and inventory controls are excellent, you have lots of box dimension and assignment controls, kitting, automated purchase orders, etc… so they should be a good fit. ShipStation is very popular but its lack of inventory features stymies me. But, it obviously works for many. As a side note, Shiping Easy and ShipStation are part of the same company now. ShippingEasy has good inventory features, too. I’ve used both ShippingEasy and Ordoro myself, and finally turned to Ordoro as total inventory solution because of their STELLAR inventory features. Per our target content for businesses of a certian size, we definitely focus on the small and startup crowd. But in my ecommerce and retail categories, many of the solutions I cover scale to $10M+ easily. The trick is finding one that has the features that you need, like your inventory dilemma with ShipStation. With the right features, say with Ordoro’s inventory + shipping all-in-one system, scaling from $5M to $10M+ is pretty seamless system-wise. Good luck and thanks so much for reading and commenting. Let me know if you have any other questions!